Some players take years to become Turf Moor heroes, many never even get close to it, but for others it can be just one game that ensures their name will be forever remembered in Burnley FC history. That's certainly the case with Trevor Meredith. 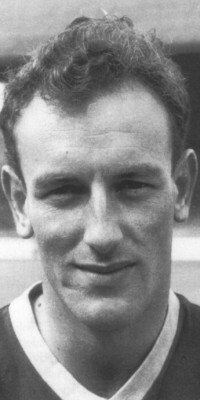 His goal just past the half hour at Maine Road on 2nd May 1960 proved to be the goal that brought the Football League Championship to Burnley for the second time in the club's history yet he wouldn't have even been playing but for an injury to John Connelly that ruled the England winger out of the run in. Meredith, born on Christmas Day 1936, joined the Clarets from Kidderminster Harriers in November 1957 after a successful trial, but such was the strength of the playing staff at the time he had to wait almost two and a half years to make his first team debut. That debut came in April 1960, as a replacement for Connelly who was on international duty. He went on to play seven of the last eight games of that season when Connelly then suffered an injury. He scored three times in those seven games but those scored against Leicester and Blackpool have been forgotten in the mists of time, the one at Manchester City never will be. With Connelly fit again shortly after the start of the following season Meredith was soon back in the reserves. With Willie Morgan coming up through the junior teams it meant he was never able to establish himself as a regular first team player at Burnley although he won two Central League winners medals during that period. By the end of the 1963/64 season he had played in just 37 league games for us and he made the decision to move on, joining Shrewsbury Town in the then third division. He spent eight seasons with the Shrews, during which time they came close to one promotion. He made over 230 league appearances for them before bringing his career to an end in the summer of 1972 at the age of 35. Meredith became a school teacher after his football days were over. It might not have been a career that hit the heights, certainly not for very long, but not many players ever get the chance to score the goal that lifts the title for his club as England's number one club. Meredith did just that.